Railway staff are responsible for the safety, security and wellbeing of passengers. On-board staff are at the heart of that team, supporting vulnerable passengers and keeping an eye out for threats. They are skilled workers, whose training and professionalism is useful everyday – and utterly vital in an emergency. Sadly, train companies and politicians in many countries think we should cut onboard staff. This leaves drivers as the only staff presence on a train that might be carrying hundreds of passengers and passengers alone. This destroys quality jobs, excludes vulnerable passengers and risks everyone’s safety. Europe must keep staff on board! Unions across Europe are taking action to defend these jobs, and guarantee passenger safety. 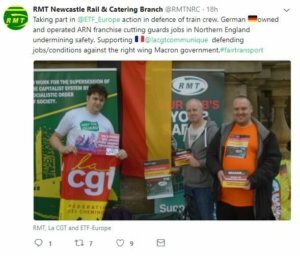 On 4 October 2018, ETF coordinated a pan-European action day where workers and union activists mobilised to keep skilled staff on our trains. The action day was part of the Fair Transport campaign, which sees European transport trade unions standing together to demand quality jobs for workers and a safe, reliable service for customers. “You’re Welcome” was the slogan of the action day, echoing the million helpful encounters that European train staff have with their passengers every day. ETF affiliates from Austria, Belgium, Bulgaria, Czech Republic, Denmark, Germany, Italy, Luxemburg, Norway, Switzerland, and the UK contributed to the Fair Transport campaign by explaining to commuters and the general public the varied and vital tasks that railway staff are responsible for. In Austria, vida distributed sweets and leaflets in several train stations across the country, highlighting the vital role that on-board crews have on Austrian trains. In cities such as Vienna, Salzburg, Graz and Linz, passengers were informed of the fact that on-board staff presence can be life-saving in critical situations. The current level of safety and security on Austrian trains can be maintained only if on-board personnel remain. In Belgium, three unions ACOD/CGSP, ACV/CSC and VSOA/SLFP jointly endorsed the action on social media. In Czechia, the Czech Railway Workers´ Trade Union handed out brochures highlighting the consequences of withdrawing on-board staff from Czech trains. In the brochure, containing hilarious comics made by illustrator Petr Urban, the union explains why it is so important to have trains accompanied by skilled staff. Around 30 000 commuters received the brochure which was distributed in railway hubs all over the country. In France, CFDT-Cheminots issued a fact sheet and support message. In Germany, EVG held a heart-warming action in extremely good taste. Railway stations in cities like Berlin, Hamburg, Cologne, and Munich saw union activists handing out cards with two chocolate hearts. One chocolate heart the passengers could keep for themselves. The other they could give to the railway staff as a token of appreciation for their important role. The union raised further awareness by distributing leaflets, news articles and a collection of testimonies from conductors. In Italy, FIT-CGIL, FIT CISL, UILTRASPORTI worked together on an awareness raising campaign and distributed leaflets to passengers. They issued a joint statement to express their support for the European Action Day. In Luxembourg FNCTTFEL and Syprolux handed out leaflets that called for on-board staff to stay on the train, in order to maintain the level of safety and security for passengers. They were distributed in train stations in the early morning to show commuters just how varied and important railway staff’s tasks are. The activists highlighted their collaboration with the police in preventing violence, aggression and anti-social behaviour on trains. In Norway, the Norwegian Union of Railway Workers released a charming video about the indispensable role of conductors. In Switzerland, SEV-ZPV handed out leaflets about the importance of on-board personnel on both the trains and inside some of the country’s largest train stations, including Zurich, Bern, Olten, and Geneva. In the United Kingdom, the RMT took action mainly in Northern England to fight against job cuts that result in lower level of safety. Commuters in railway hubs like Bristol or Newcastle received stickers that read “Our job – your safety”, informing them about the current situation and explaining the serious consequences of job losses in the sector.